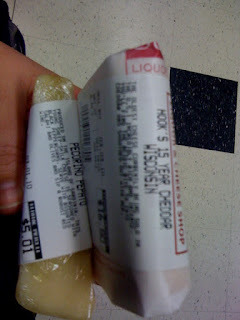 Remember back when I wrote about how excited I was for Hook's 15-year cheddar to make its way to Minneapolis? Well, it made its way to Surdyk's Liquor Store and Gourmet Cheese Shop, and thus I made my way to Surdyk's twice since then to procure some. While some aged cheddars take on an extremely bitter quality, most likely brought on by the temperature being raised during the aging process, the marginal bitterness of the Hook's 15-year is balanced with sourness and saltiness expected in cheddar cheese. Like so many aged cheeses that I enjoy, the lactic acid has crystallized in the Hook's 15-year forming a few crunchy bits of calcium lactate, the crystals ranging in color from darkish yellow to almost white. Overall, the cheese has a balanced, intense, cheddar flavor. It's only slightly crumbly. It's $60 per lb, so I budgeted for it, forsaking other indulgences. It was worth it. It's good cheese, dude.